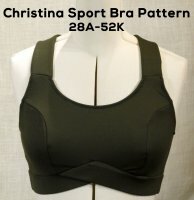 I love the Christina Sport Bra pattern. The cup sizing is great and accurate, the fit is fantastic and it is so comfortable. I thought the cross over front band was pretty for looks, but now that I have made it, I don't want any other band, it makes it sit so nicely around the body and stays in place all day. I also found the straps very comfortable and the right width. Best sports bra pattern and the only one that goes up that high in cup sizing! Of course, PDF is the best since you can download and get sewing as soon purchase.I like the option to print color or black and white (using black and white setting on my printer). Sometimes color is just better on bra patterns. I also like that there is a You Tube video "sew along" to go with the instructions.